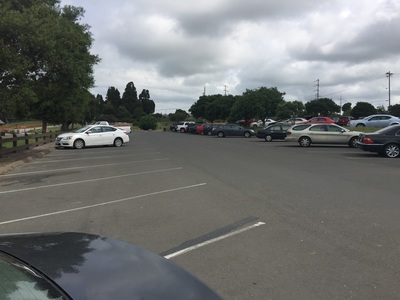 Parking: $3 per vehicle and $2 per dog when kiosk is attended (April-Oct on weekends and major holidays). Free parking on all other days. Hours: April: 7 A.M.-5 P.M, May-Sept: 7 A.M.-7 P.M., Oct: 7 A.M.-5 P.M., Nov-Mar: 7 A.M.-4 P.M.
Dog Rules: Dogs allowed off-leash in undeveloped areas. Dogs are not allowed in the marsh or on the fishing pier. 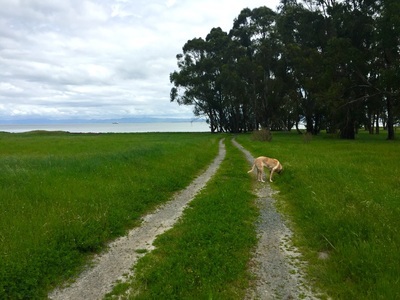 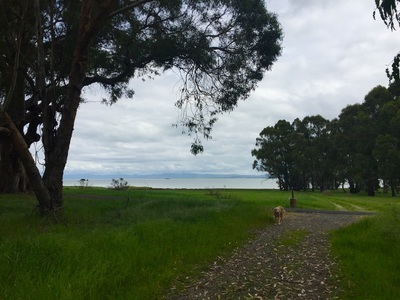 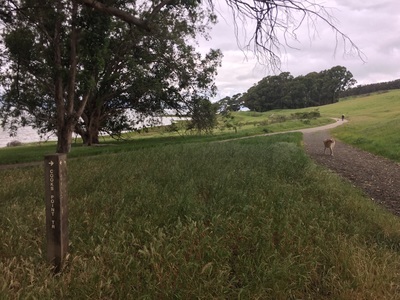 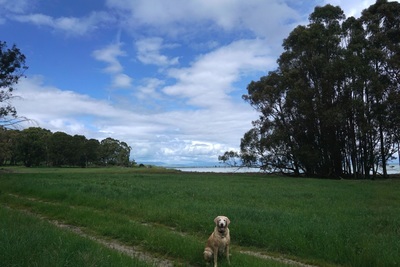 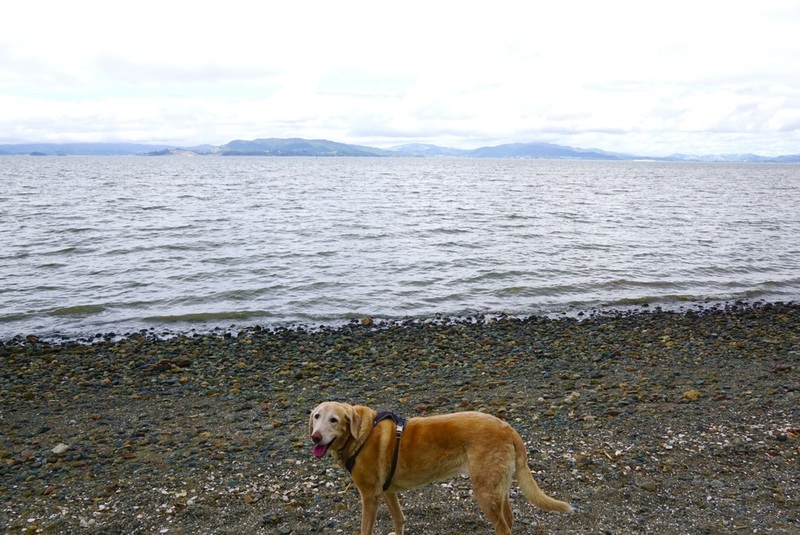 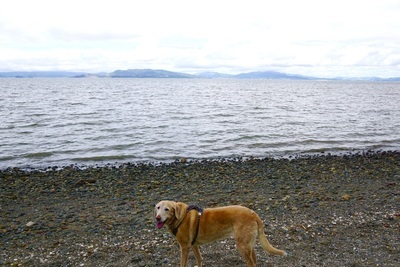 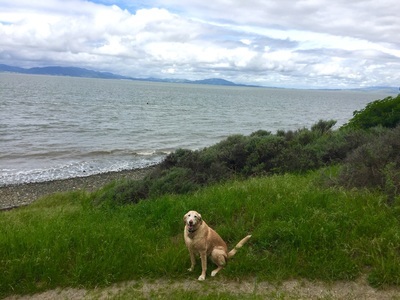 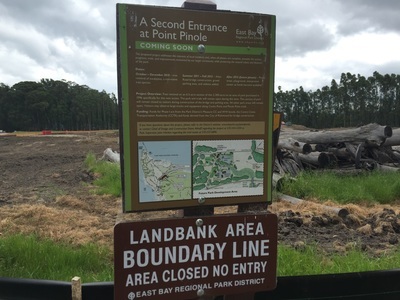 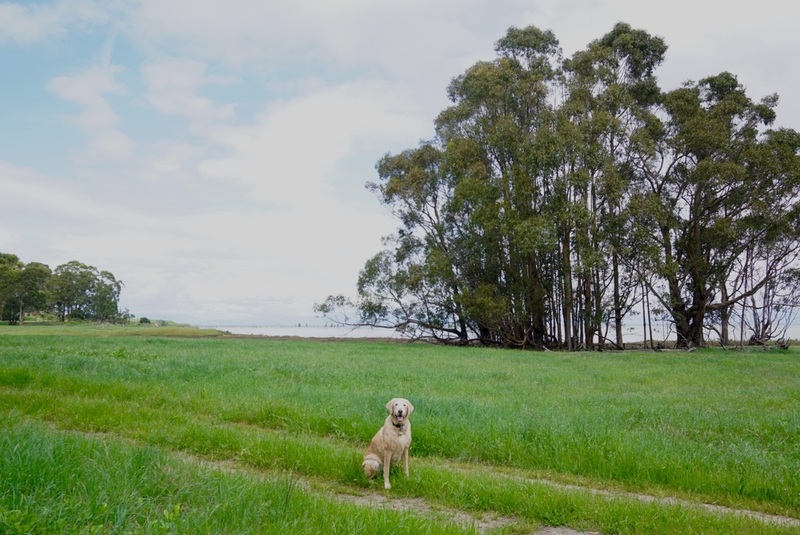 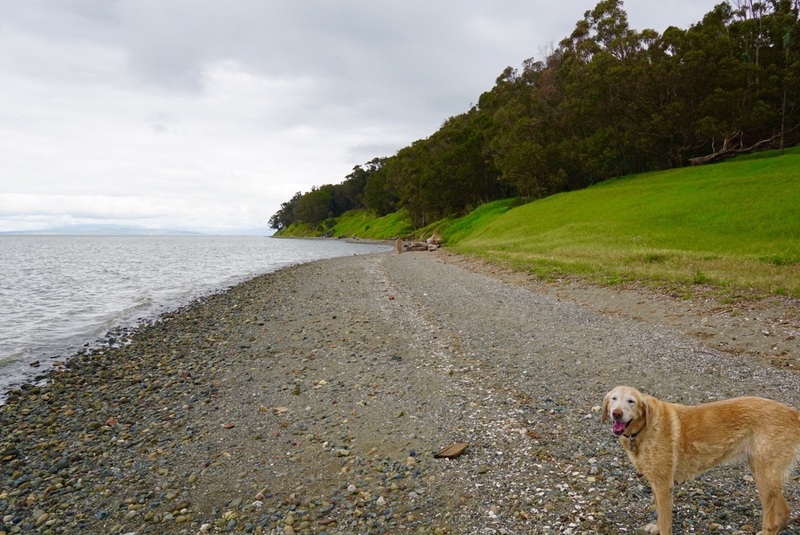 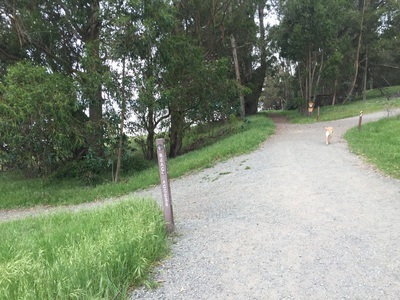 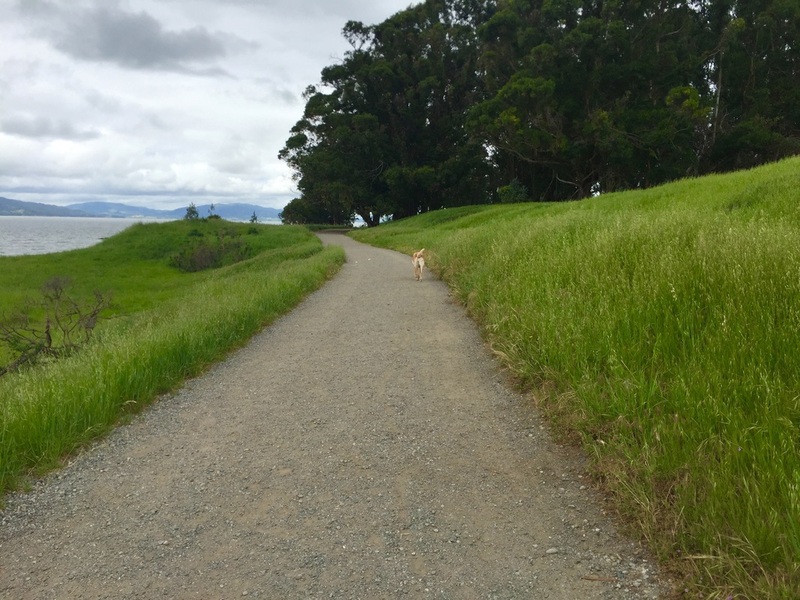 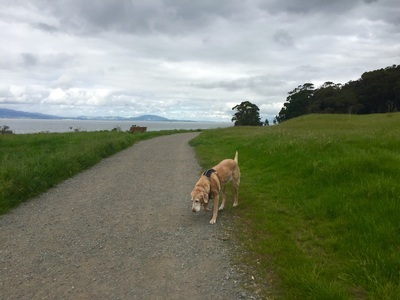 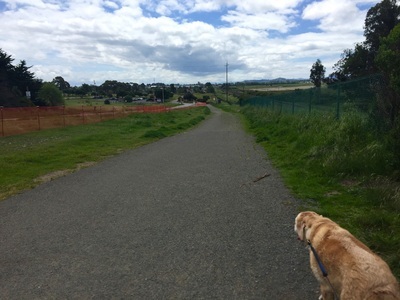 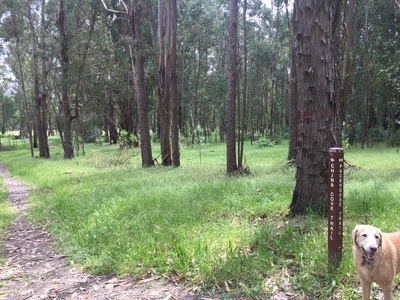 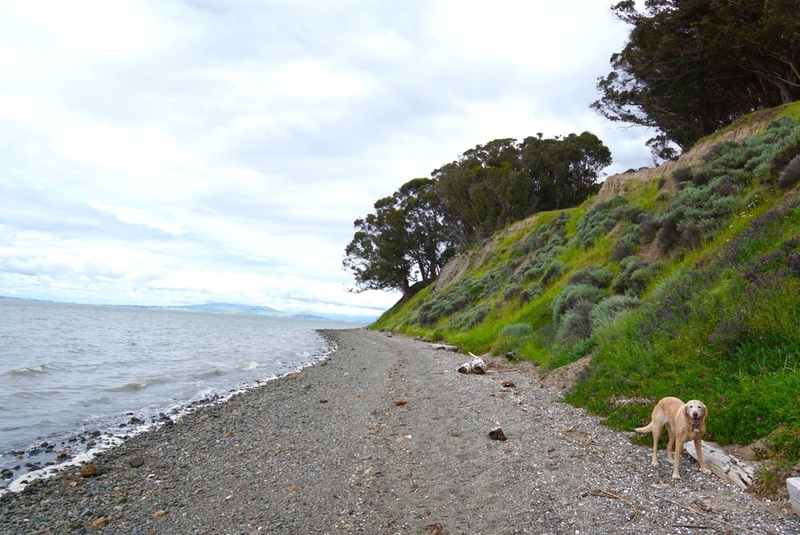 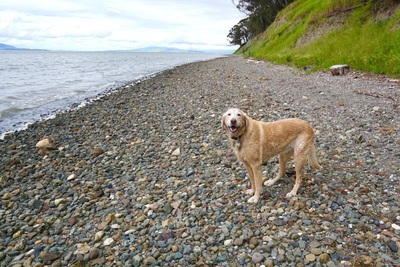 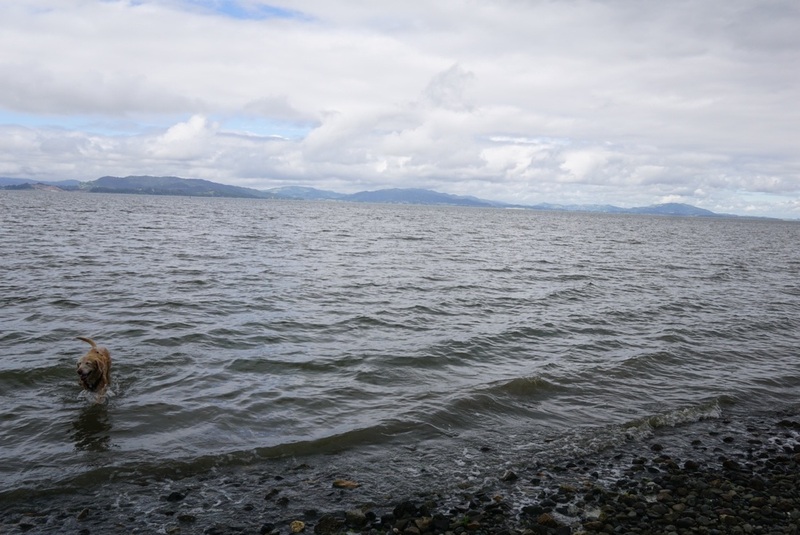 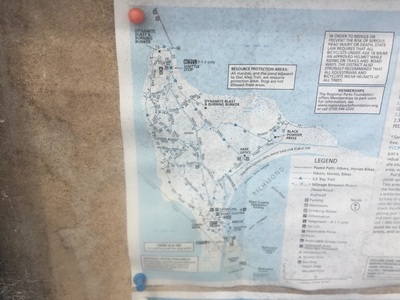 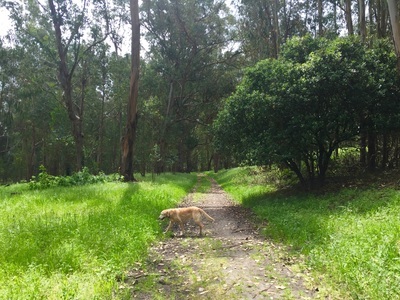 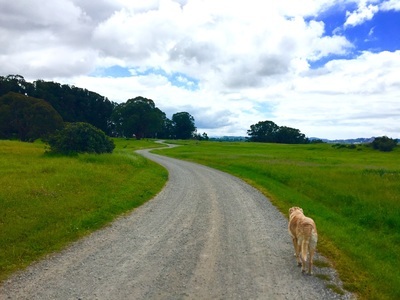 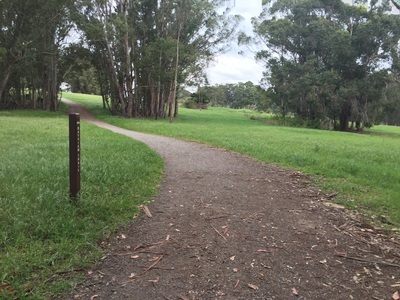 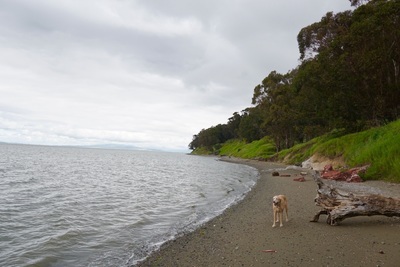 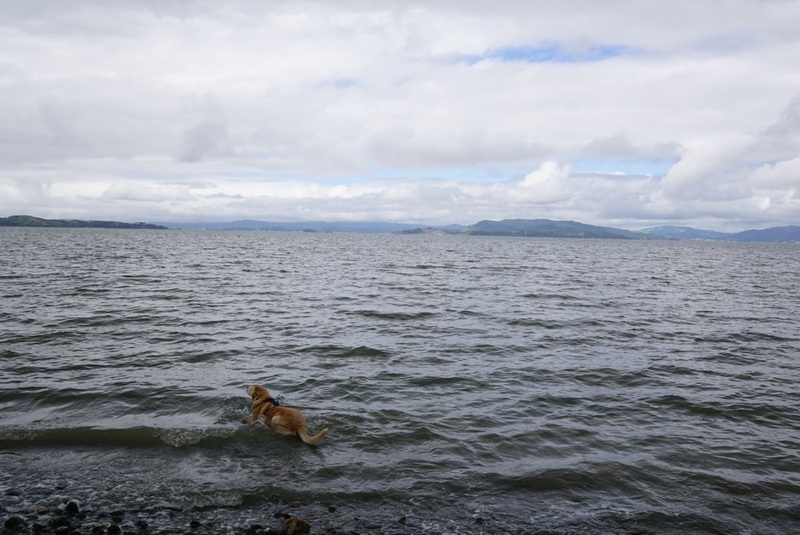 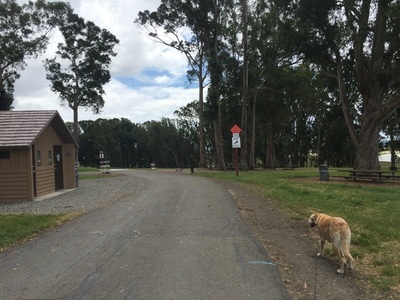 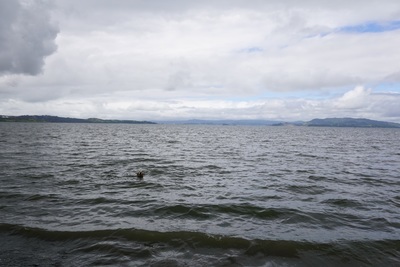 Dogs must be on leash in developed areas (during the beginning of the hike and the paved Pinole Point Trail). 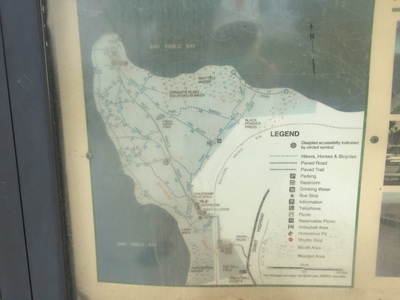 Best time to visit: Anytime, except the peak of a hot day. 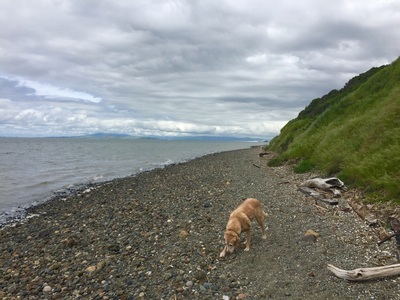 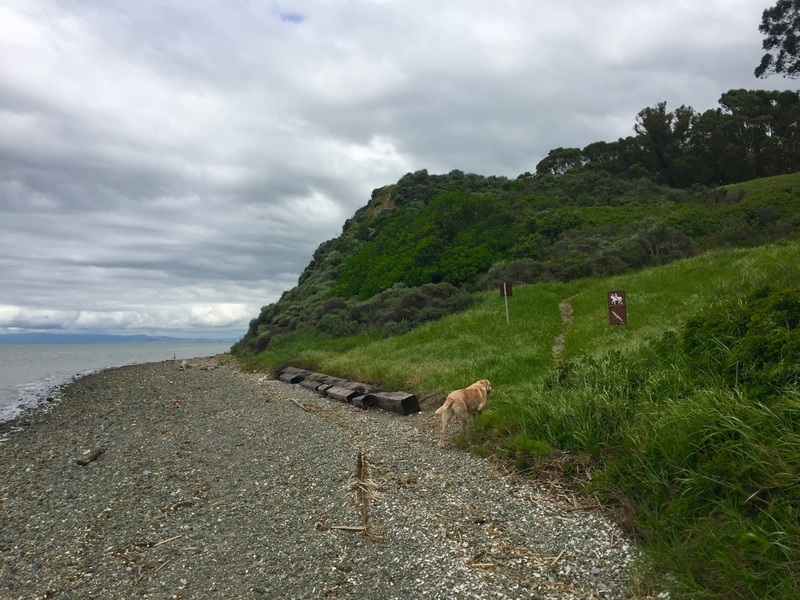 The trails are mostly exposed to sunlight, and although there’s usually a breeze, it’s about a ¾ mile walk to the beach and the ground could get too hot under your dog’s paws. 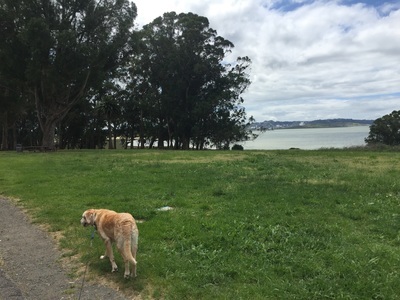 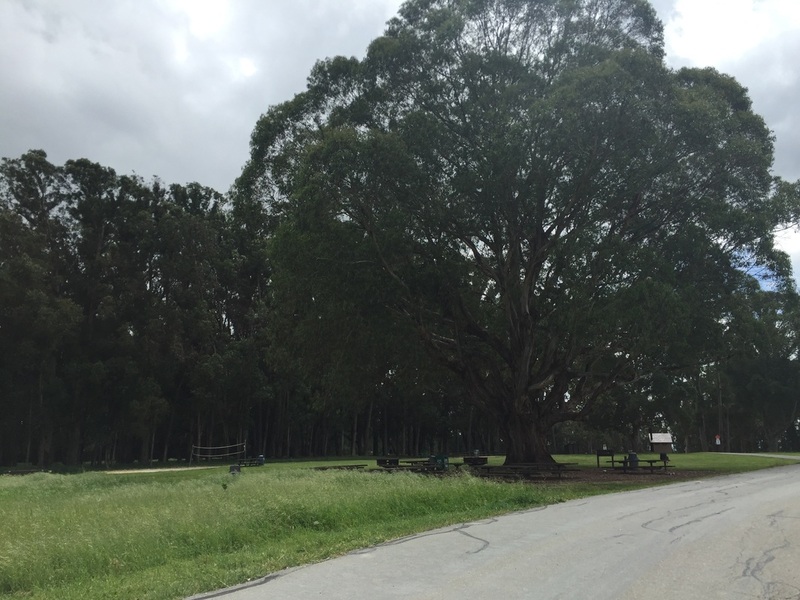 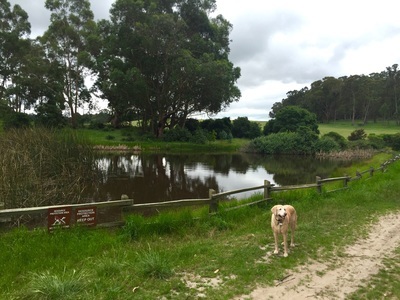 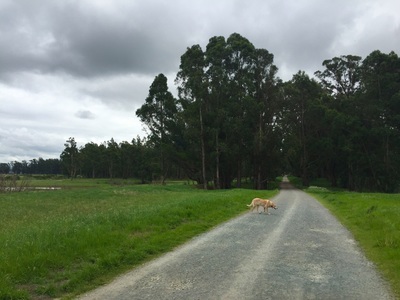 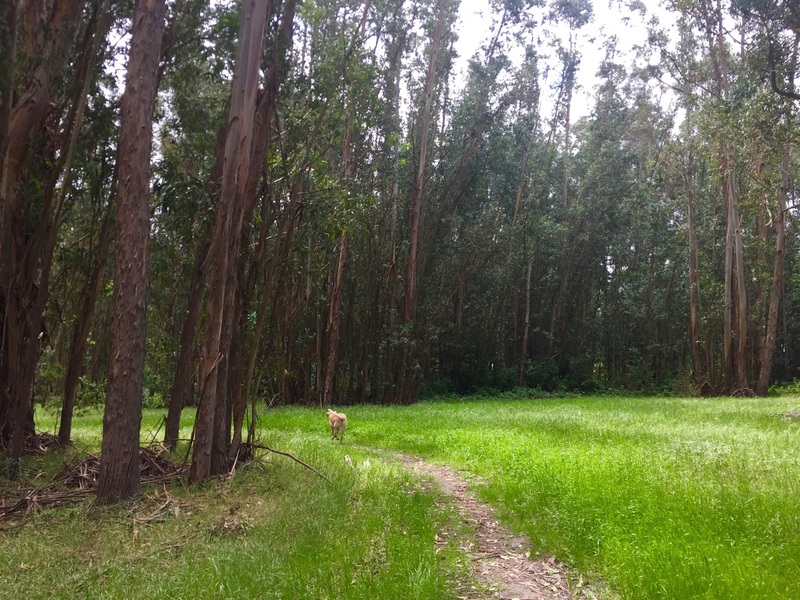 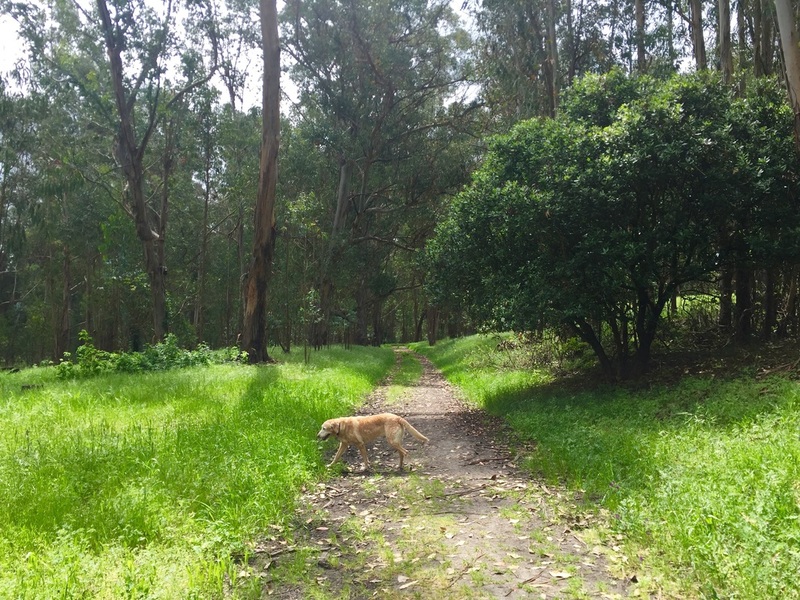 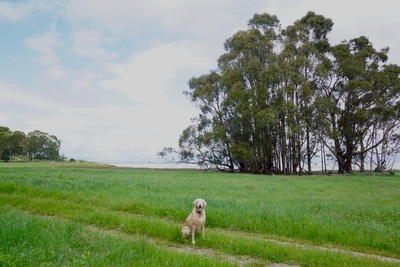 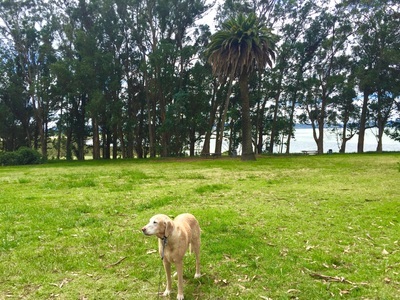 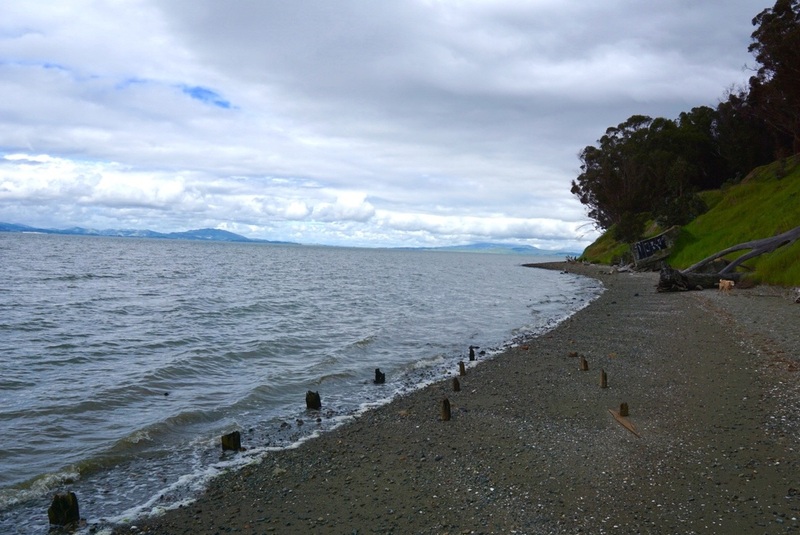 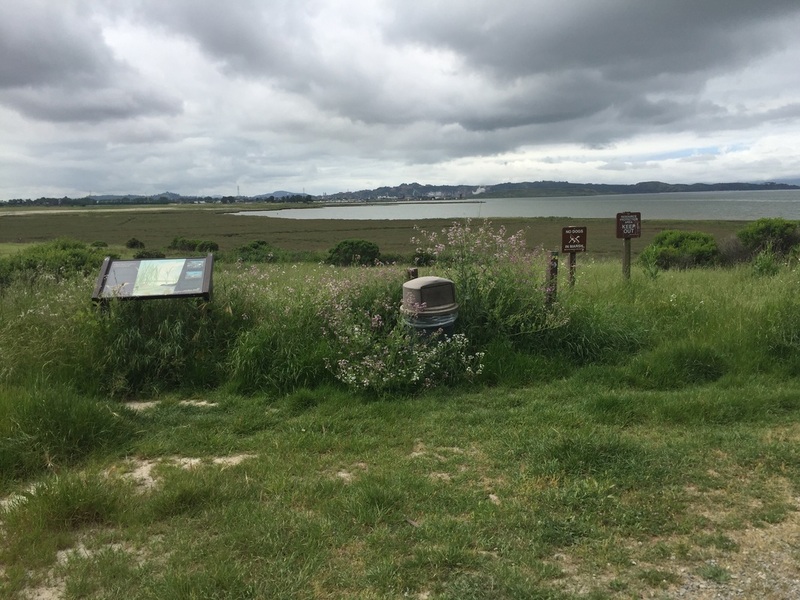 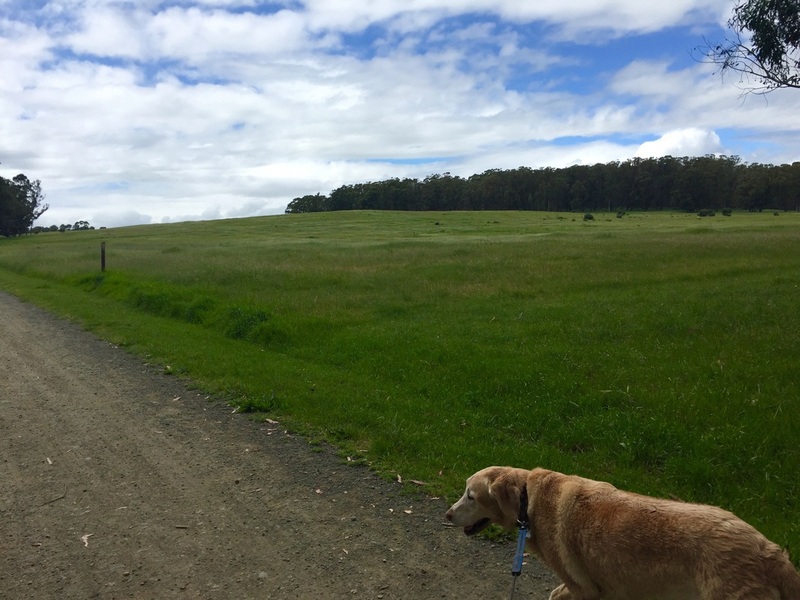 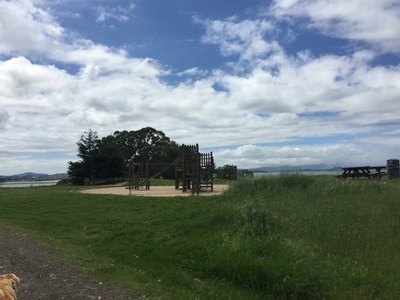 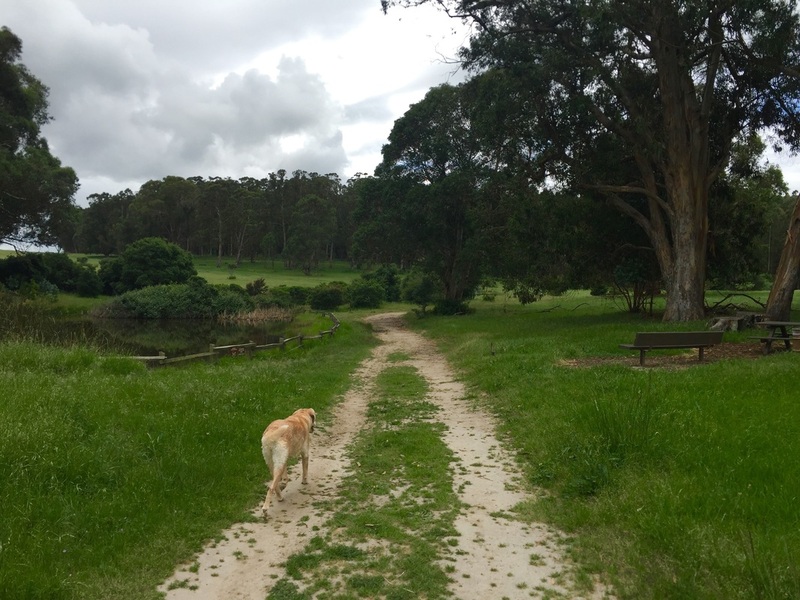 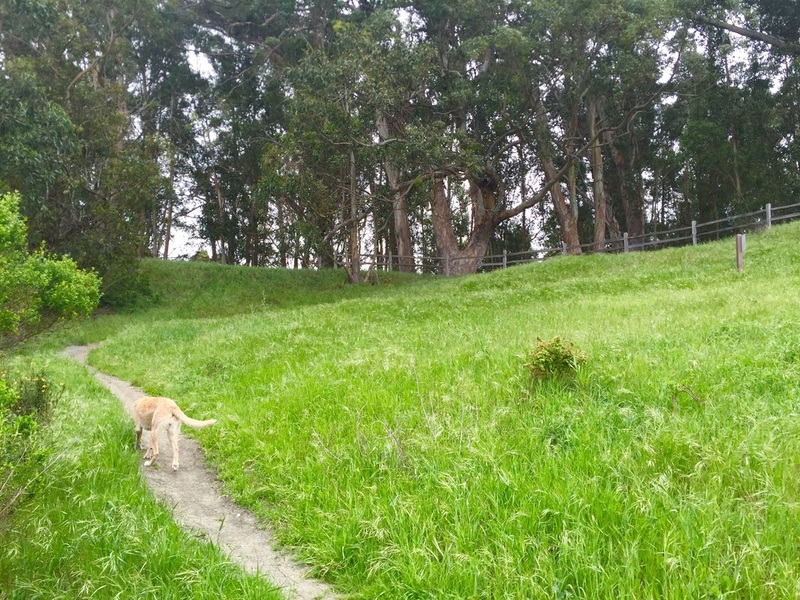 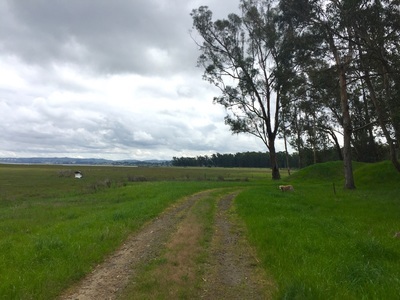 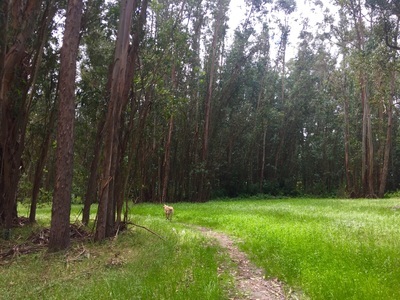 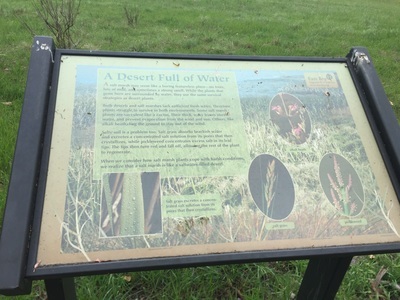 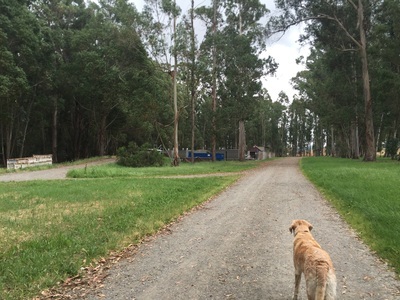 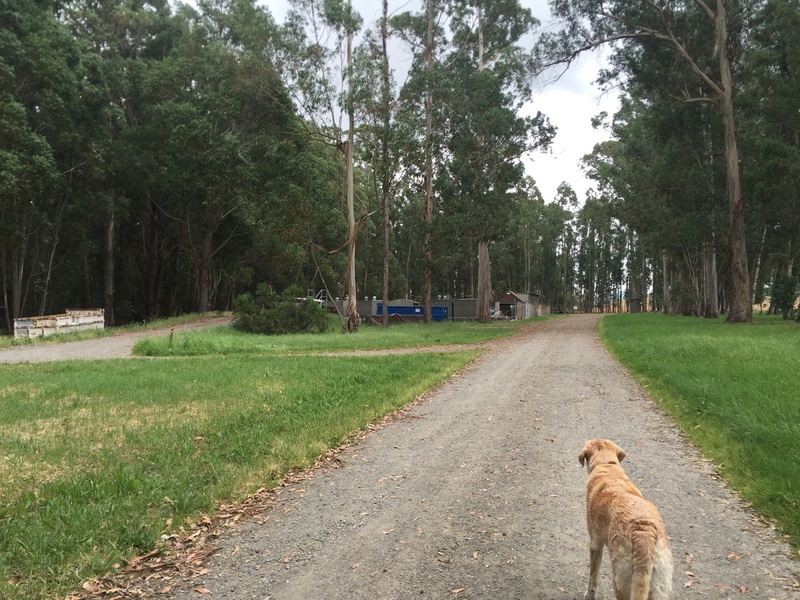 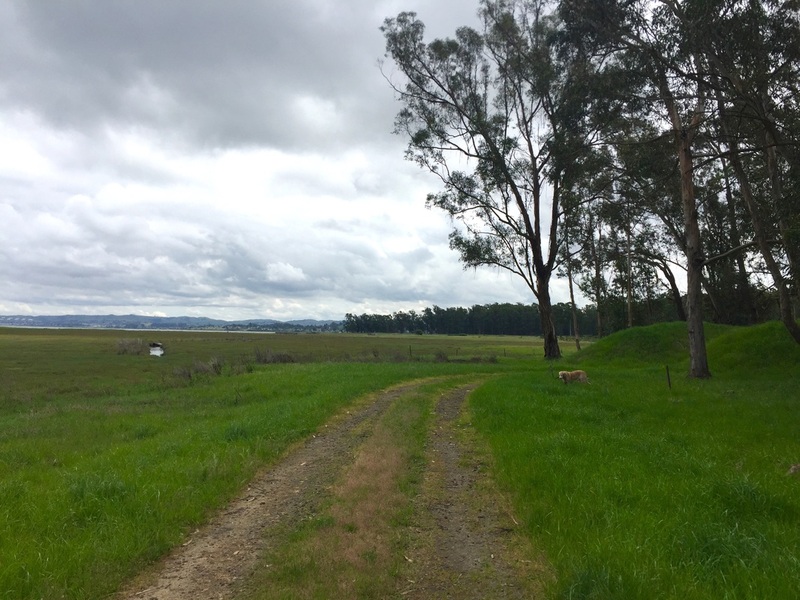 Description: This 2,315-acre park is reminiscent of Fort Funston or Point Isabel. 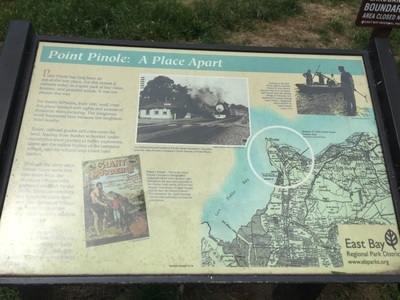 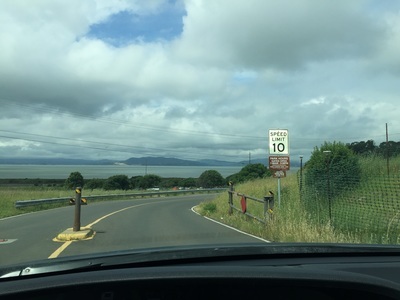 Although it’s located very close to Point Isabel, it’s much less crowded, and also significantly bigger (Point Isabel is less than 50-acres). There are miles of easy trails, bay views and even beach access. 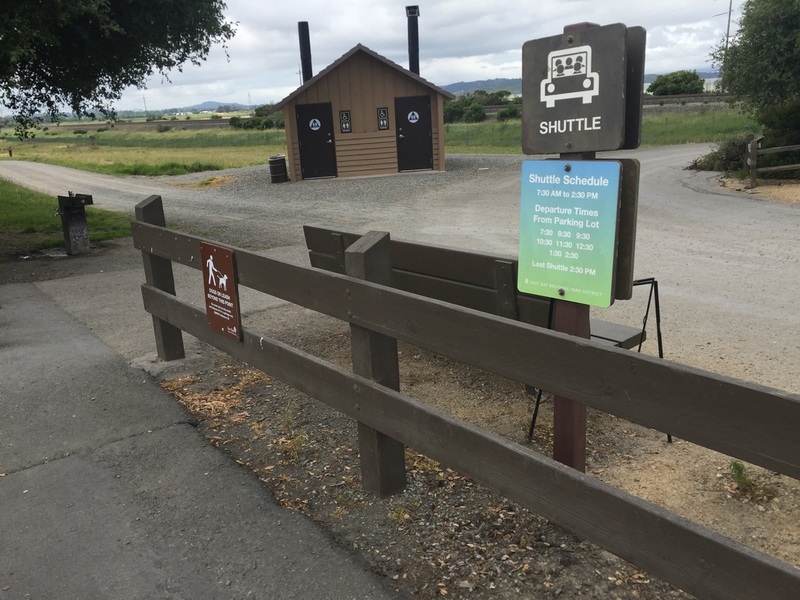 When you first walk in, your dog must be leashed because a shuttle bus drives through hourly to transport people to the fishing pier. 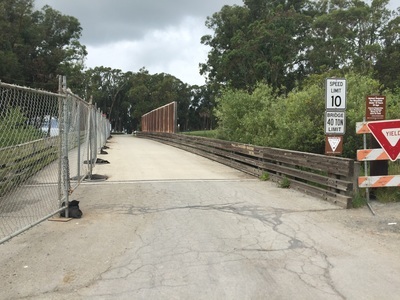 You cross a bridge over train tracks, and we saw a train pass by. 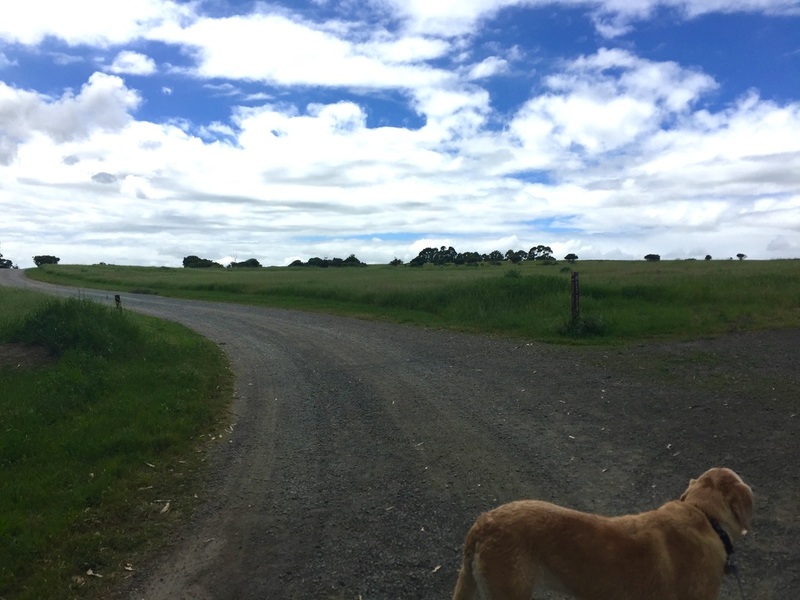 It’s quite loud, so please be aware of this if your dog scares easily. 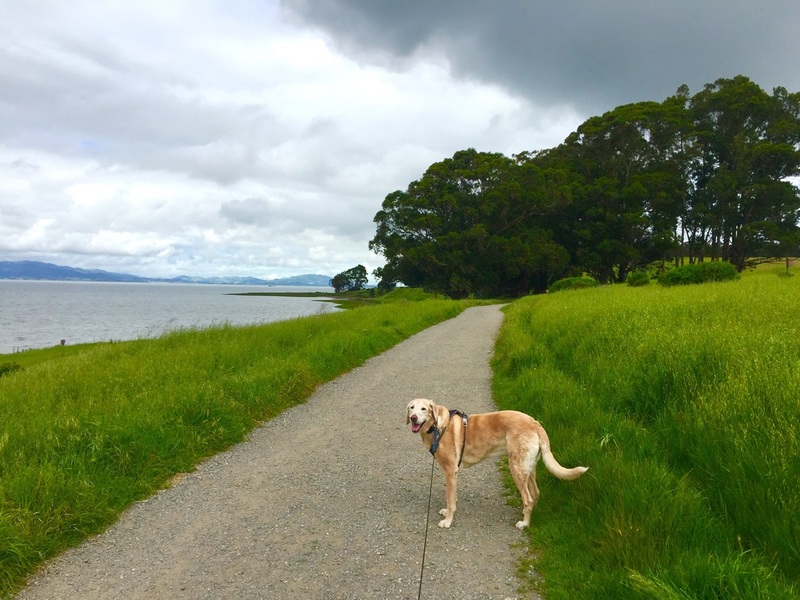 We continued our hike and left the paved trail, heading down to the Bay View Trail. 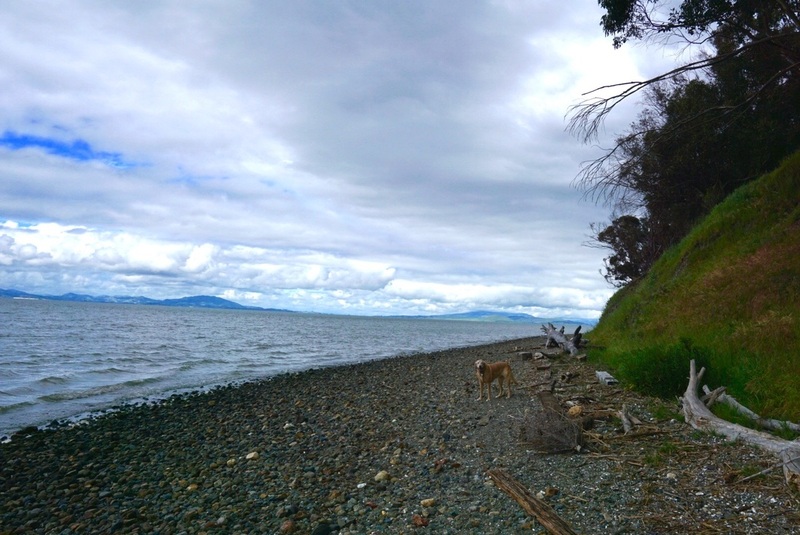 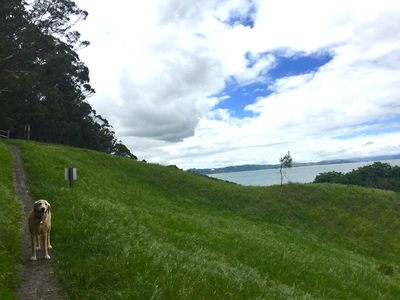 This trail runs along the water and has spectacular views of Mt. 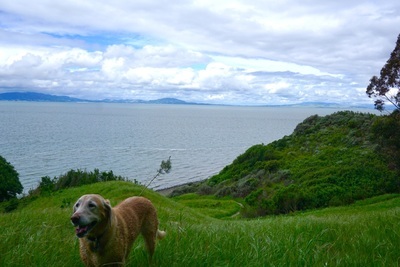 Tam and the shores of Marin in the distance. 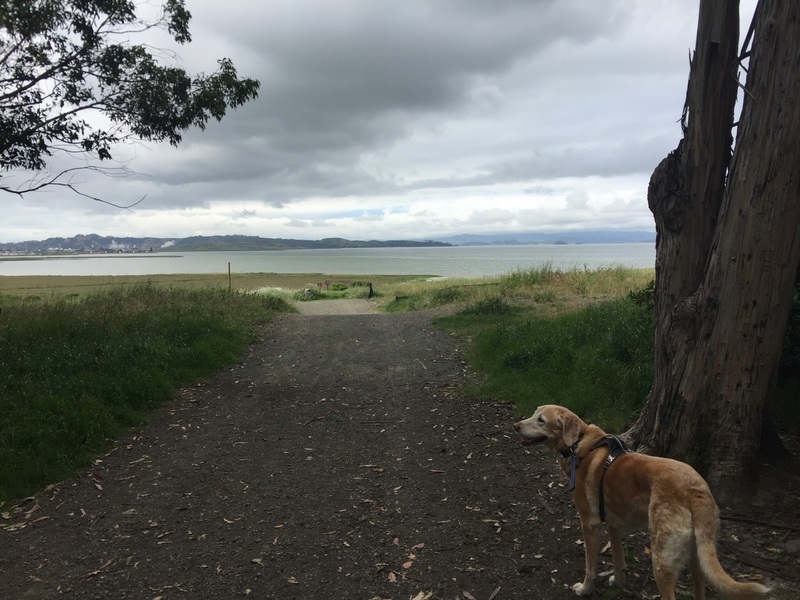 You will pass a few trails with access to the water, but this is the protected marsh area and unfortunately is not dog-friendly. 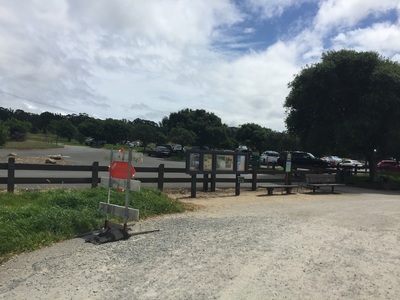 Once you pass a restroom you will see a “beach access” sign to your left. 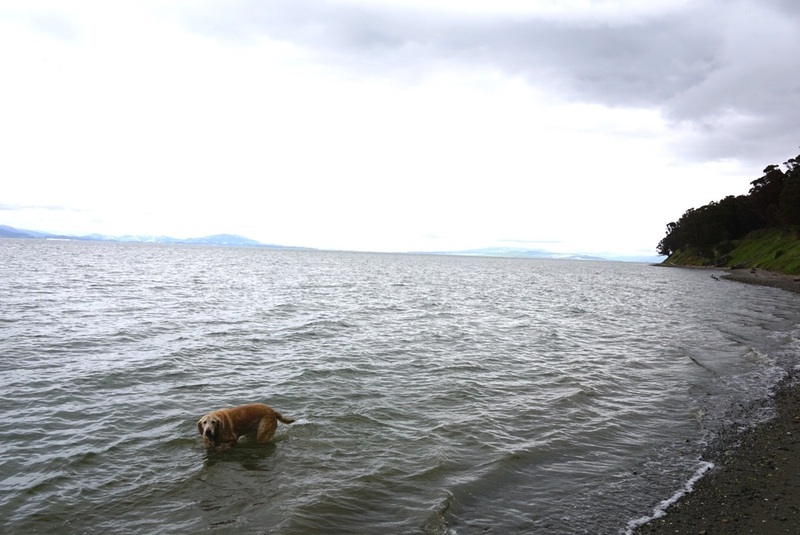 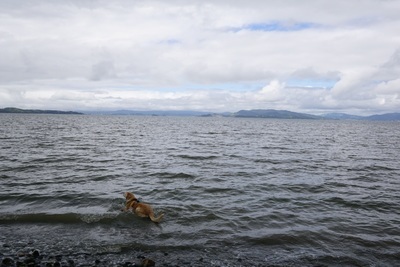 Head down to the beach and your dog can go for a swim. The beach itself is beautiful, strewn with sea shells and colorful rocks. 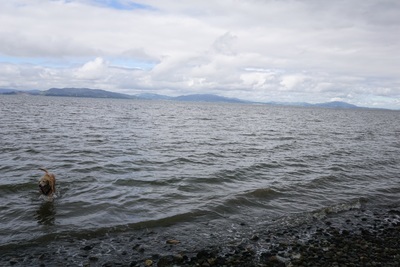 The waves are also gentle. 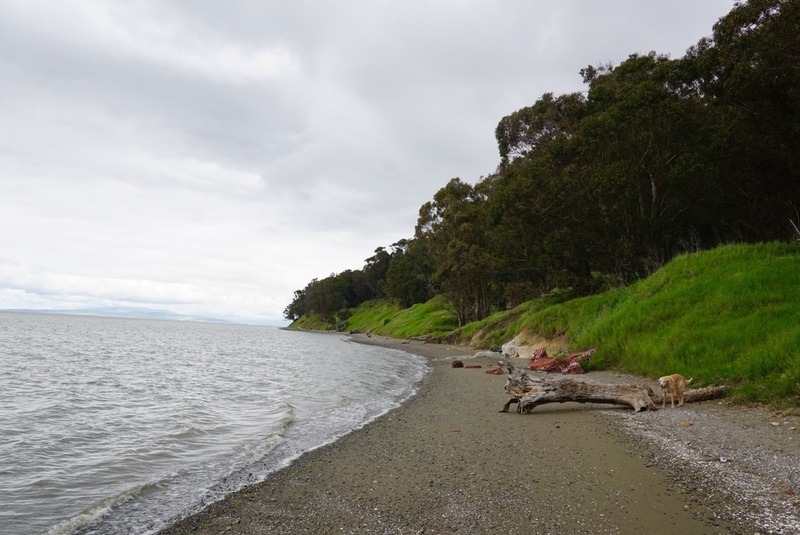 You can walk down for about a half a mile on this beach. About half-way down, look out for what appears to be the posts of an old pier sticking out of the water and on the beach. 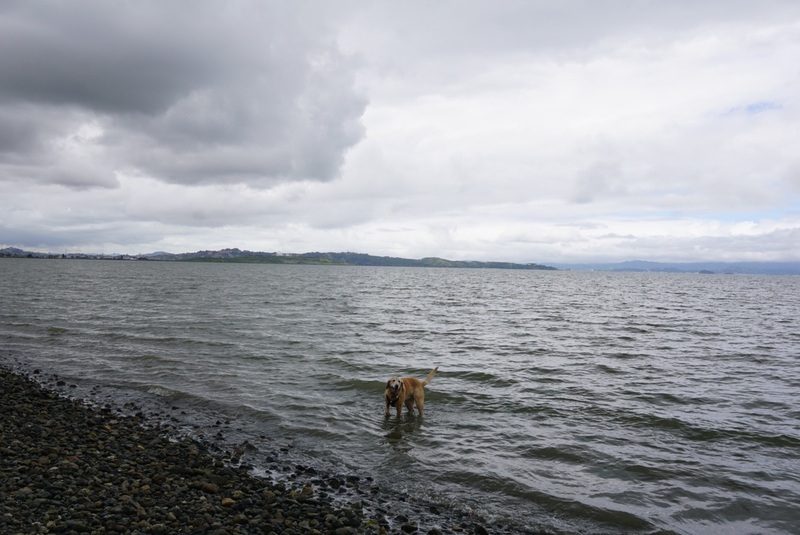 I would not recommend letting your dog swim in that section because you can’t see the posts in the water and your dog could injure its paws. There are plenty of other stretches of beach to swim. 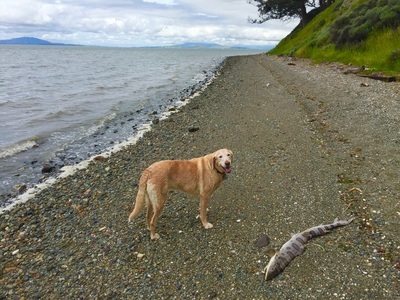 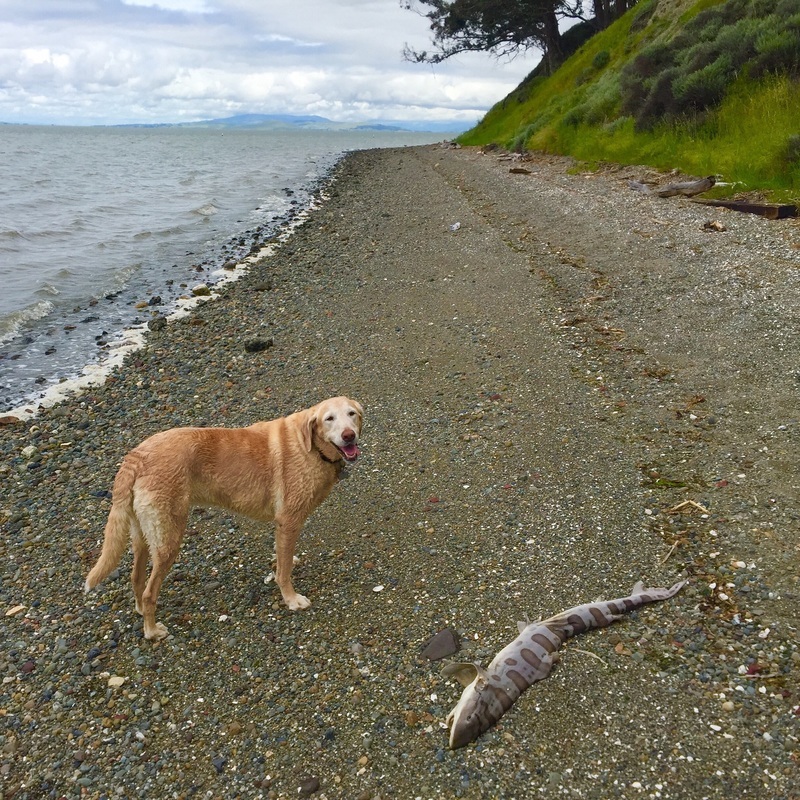 Also keep an eye on your dog if it likes to eat things it shouldn’t, because we saw a washed-up shark on the shore. 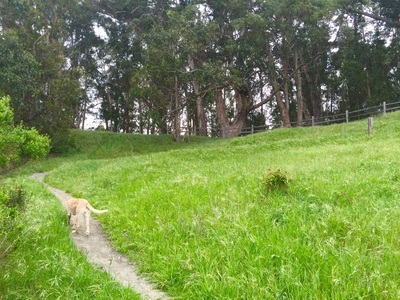 From here we took an unmarked trail back up (marked with an equestrian sign). 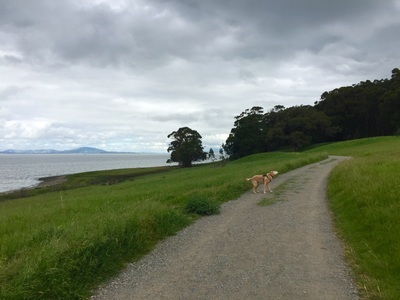 We walked back in the direction we came and shortly saw China Cove Trail. We followed this trail towards the other side of the water to view the dynamite blast bunker. 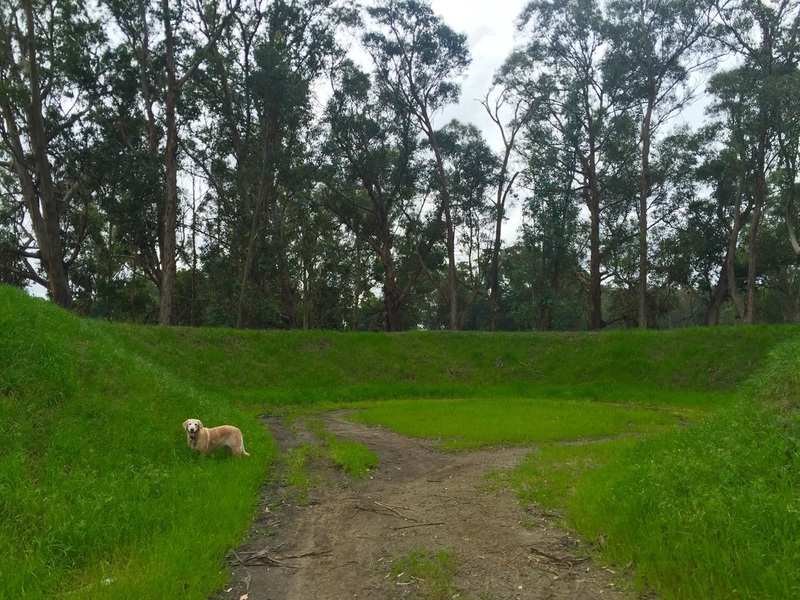 This used to be a testing spot for explosives manufacturers. 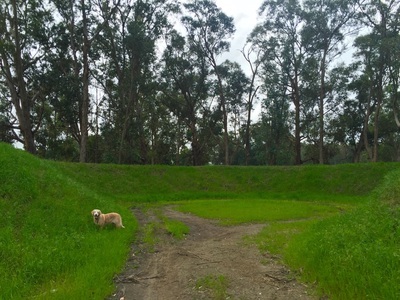 Unfortunately it’s just a crater now. 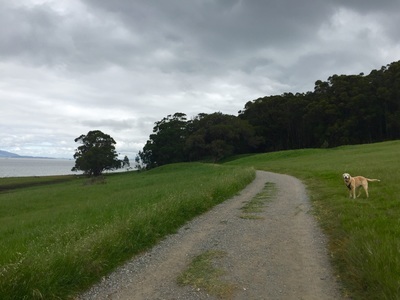 We headed back to the China Cove Trail and continued on the Owl Alley Trail. Soon we saw a beautiful pond with a perfectly placed picnic table next to it. 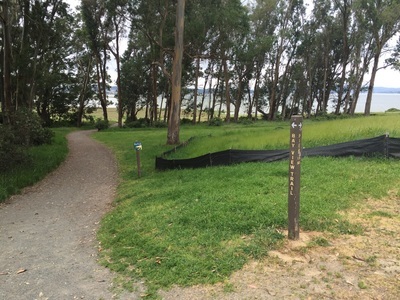 From here, we continued on Owl Alley Trail, and the took Cooks Point Trail back to the parking area. Please note that there is a quarry near the intersection of these two trails, and you will hear a steady pounding as you approach. It cannot be heard elsewhere in the park, but if your dog is scared of loud noises I would avoid this area. 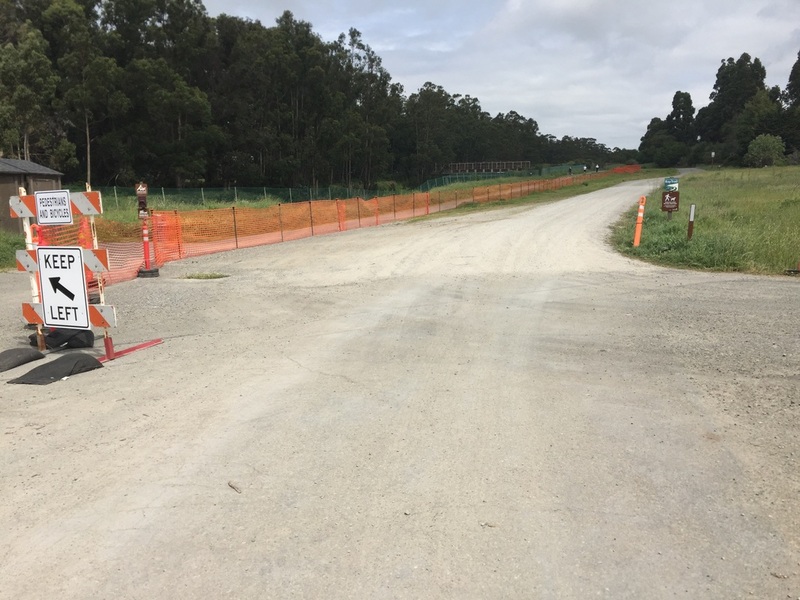 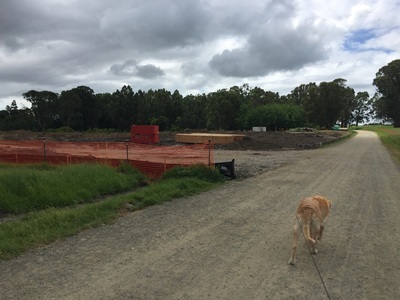 The parkland in back of these trails is currently under construction to bring some park improvements as well as a new entrance. 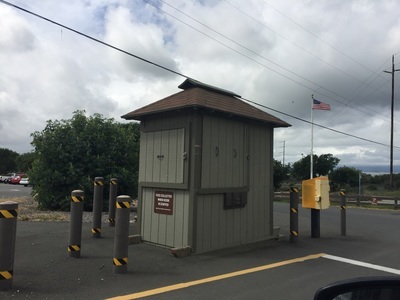 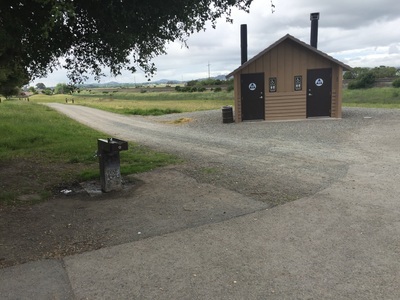 As you head back towards the parking lot on Cooks Point Trail, you will pass more restrooms, a water fountain, plenty of picnic tables with BBQ pits, a children’s play structure and a volleyball court. 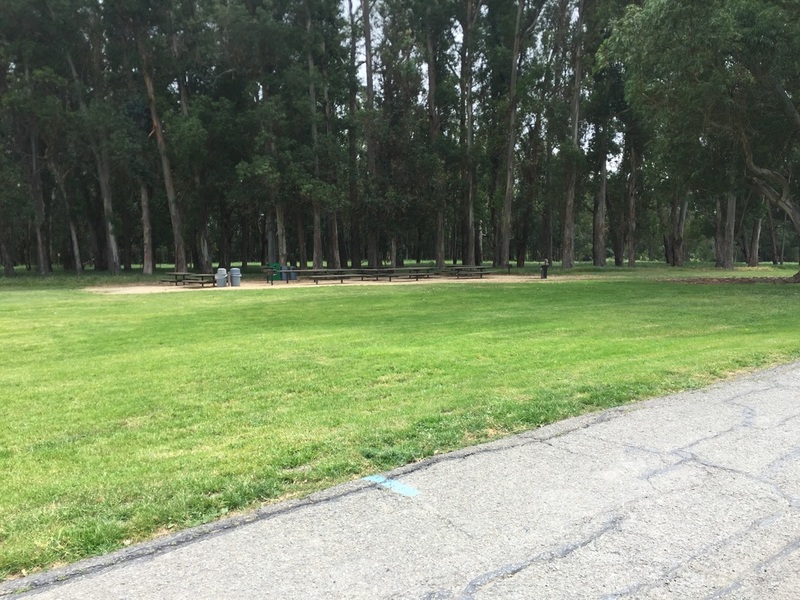 This is a great area to stop and rest at a picnic table overlooking the water. 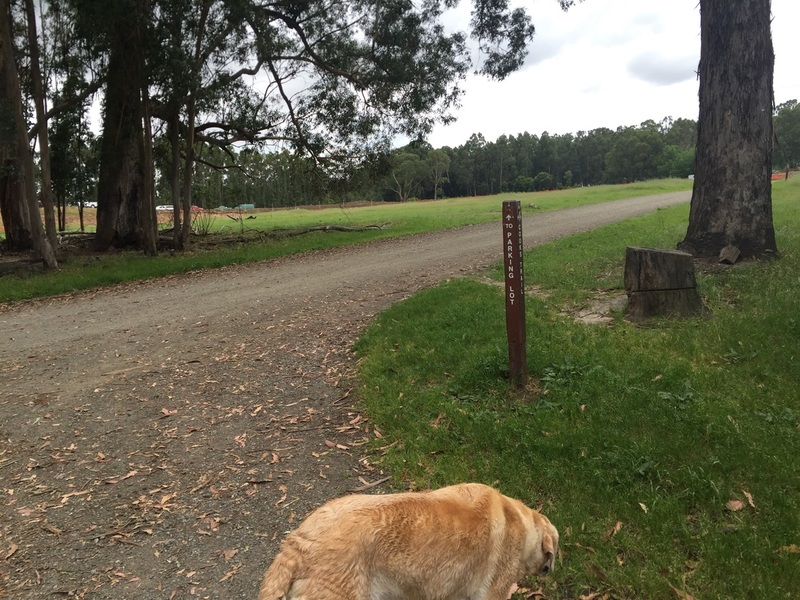 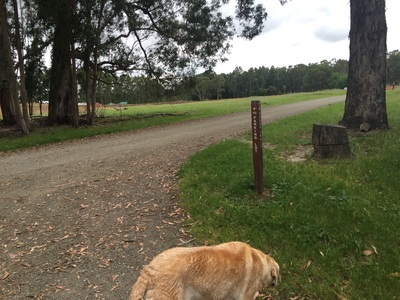 This park has running water, doggy clean up bags and pit toilets at the trailhead and in the middle of the park.